Getting to and removing the two hex head bolts that hold the starter to the bellhousing can be a real test of your sanity - especially if you don't have the right tool! 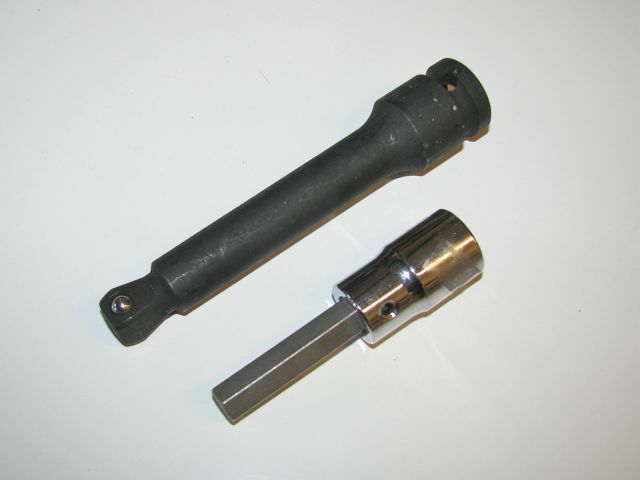 You will need a heavy duty hex socket on a strong wobble extension. I think they must have used a Gorilla to install these bolts at the factory! You need to be able to angle the extension but a universal joint is too floppy and often not strong enough. Keep in mind you will need to remove these two stubborn bolts if you want to drop your transmission! NOTE: You will receive either a 3, 5 or 7 inch long impact grade wobble extension - depending on what we have in stock. The length here is not important. The strength of the wobble IS. I have broken cheap wobble extensions trying to get starter bolts off in the past. These are super strong. The 10 mm hex head socket is also very strong and high quality tool from Urrea.